The Stables01263 715779work01603 870304fax Self-cateringThe Stables is a superb property just on the outskirts of Holt. Sleeping up to 4 people it is the ideal destination for a family getaway. The spectacular North Norfolk coast is only a short drive away and there is plenty to do in the area. • Outside: Sunny patio to front of property with table and chairs. Access to 2 acres of grounds laid mainly to lawn. • Notes: Pillows and duvets are feather filled. The Stables offers weekly bookings starting on Saturday. 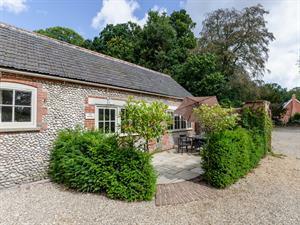 The Stables is a superb property just on the outskirts of Holt. Sleeping up to 4 people it is the ideal destination for a family getaway. The spectacular North Norfolk coast is only a short drive away and there is plenty to do in the area.